Albertina Sisulu in Johannesburg in 1984. Photo: Paul Weinberg, University of Cape Town Libraries. Not only does Africa remain largely absent from social science research using social movement perspective…[but] social movement theory largely focuses on social movements in Europe, North and South America and tends to neglect the African continent, with the exception of South Africa. Even in analyses of the contributions of African revolutionaries, a narrow, gendered lens seems to focus solely on the male figureheads of African social movements–including individuals such as Nelson Mandela, Thomas Sankara, Patrice Lumumba, and Kwame Nkrumah. This leaves African women leaders on the periphery, especially in social and political science discourses. However, it is imperative to analyze the roles of African women revolutionaries in social movements, especially in countering mainstream narratives that characterizes them as illegitimate in Western contexts. In their book African Women’s Movements: Changing Political Landscapes, scholars Aili Mari Tripp, Isabel Casimiro, Joy C. Kwesiga and Alice Mungwa examine the significant role of African women as revolutionaries before colonialism, during colonialism, and after independence. The authors highlight African women’s political mobilization, collective action, and historical traditions of resistance. By analyzing African women’s social and political influences and organizing of anti-colonial resistance and national liberation movements, the text offers a glimpse into the various ways African women have asserted their agency. Although colonialism prohibited and in many cases restricted women’s political mobilization, African women were key leaders in independent movements despite being politically disenfranchised. For example, in 1944, Lady Oyinkan Morenike Abayomi formed the Women’s Party in Lagos to advocate for women’s rights in Nigeria. Displeased with the hyper-taxation without political representation, Lady Abayomi and the founders of the party were critical in lobbying for more educational and economic opportunities for women. Seven years later, in 1951, activists Mabel Dove Danquah and Hannah Benka-Coker were pivotal in leading ten thousand women in a protest against increasing food prices in Freetown, Sierra Leone. Dove later became the first woman in West Africa to be elected to the legislature in 1954. After petitioning colonial administrative offices to “allow market women to regain their monopoly of the trade in palm oil and rice,” women activists organized the Sierra Leone Women’s Movement (WLWM) in 1951. The WLWM played a key role in supporting Sierra Leone’s Nationalist Movement as well as advocating for greater representation of women in politics. These efforts continued in the decades to follow, as women across the African continent played critical roles in political and social movements of the 21st century. For example, in 1992, a group of elderly women in Cameroon’s Social Democratic Front (SDF) played a critical role in catalyzing peace after the onslaught of post-electoral violence. Leading silent morning protests–including exposing their breasts and displaying peace symbols–many believe that it was the “fear of their supernatural powers” that prohibited military forces from arresting Ni John Fru Ndi, who was the founder and chair of Cameroon’s SDF. In this context, Cameroonian women showcased their political strength and ability to mobilize vis-a-vis the sacred and the spiritual. 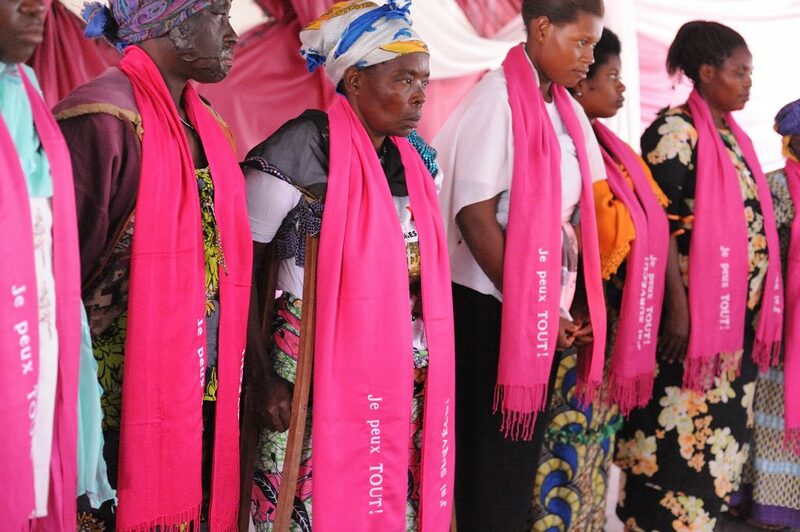 Women activists in Rwanda, 2008. Photo: Julien Harneis/Flickr. While this piece only highlights African women’s activism in certain countries, there are countless women activists who have spearheaded social movements in Africa. 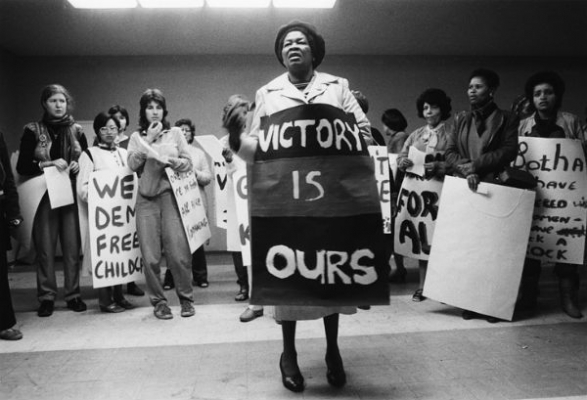 Although women activists such as Wangari Maathai, Ellen Johnson Sirleaf, Albertina Sisulu, and Winnie Mandela are globally renowned in their own right, and while scholars have done outstanding work about African women’s activism, there is more work to be done in highlighting African women’s significant contributions to social movement building. To deny African women as revolutionaries is to deny their existence as both fundamental and functionary agents of social change. These women’s efforts should not be marginalized or overlooked. Nor should they be denied a space to talk about their own contributions — within and outside academic and activist spaces. Although many scholars look to the United States as the starting point for revolutionary work by women in regards to gender equity and feminist and womanist discourses, it is imperative to recognize African’s women contributions to this history. As scholars Aili Mari Tripp and Balghis Badri have argued, “African women…have contributed significantly to global understandings and implementation of women’s rights.” Indeed, African women are not mere spectators in catalyzing revolution; they are the blueprint of social movements on the African continent and beyond.